Hopefully, that title doesn't sound too dumb; Anyways, welcome to this little experiment of mine. If you may recall from a little while back, I brought up the movie Hellraiser in a post as an example of a movie that's had its color grade extremely skewed for home releases. (2019-01-14, 05:57 AM)LucasGodzilla Wrote: Anyways, I suppose the best way to start a thread like would be to show a drastic comparison or something like that. A while back on the Blu-Ray forums in a thread for Blue Underground's 4K transfer of Lucio Fulci's Zombie, there were a few posts that took a brief tangent away from Zombie and went to talk about Clive Barker's Hellraiser. There was a post by a user under the name of JohnCarpenterFan that was kind of an eye-opener for many: It basically compared high-quality stills from a preserved archival print of the movie with the Arrow transfer, ranting about their differences. JohnCarpenterFan;15869547 Wrote: It is very interesting that you brought up Hellraiser. I recently managed to get my hands on a well-preserved archival print, watched it, took some scans, made sure they were representative of how it looked correctly projected and compared it with the Arrow Blu-ray. Be aware that I really liked the Arrow Blu-ray despite the peculiar grain, and didn't have any problems with the color timing... When I watched this print, I couldn't believe my eyes. 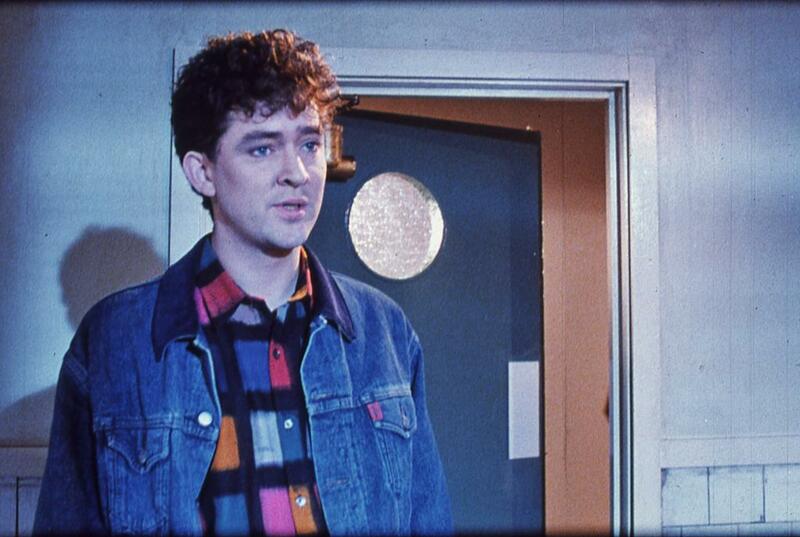 This film when viewed on film looks absolutely incredible, very stylish, quite a lot of blue lighting. I had no idea this film looked that good, home video has just done it a complete disservice. One thing I will say is that this print was not grainy at all, even in low-light conditions there was nothing out of the ordinary, I wasn't even aware of it most of the time. When I flicked through the Arrow disc not long after, it looked flat and orange compared to what I had seen, it looked ugly and noisy. 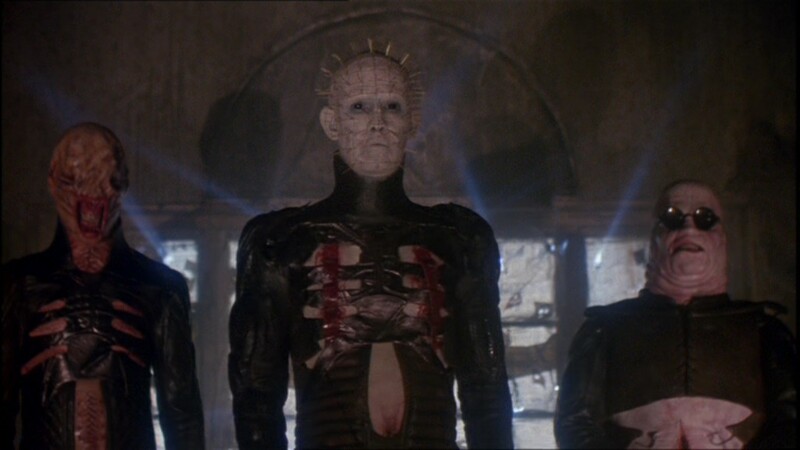 In the scene where the cenobites appear at the hospital, the room in the print appeared more blue with Pinhead's skin also being bathed in blue which helped draw attention away from the make-up, on the Arrow the room is more neutral and the make-up job on Pinhead really stands out. Also in a scene near the end (see last picture below), in the print, there's clearly blue lighting in the background and the characters directly in front of the camera are covered in a warm glow from a fireplace (IIRC), yet on the Arrow, everything is again flat and orange. It was like watching the film for the first time. I'd love it if every studio/label took the Warner approach and used answer prints (or at the very least view multiple theatrical prints) to assist with color timing. This "Hold back on the colors/contrast, keep the shadows intact, make everything look natural" way of thinking has got to go. It's not purist in the slightest, in fact it goes directly against what film naturally looks like. Reading this, I decided to do a bit of a comparison and ripped my Arrow copy of Hellraiser for comparison and well, the differences are pretty big. I weren't able to find the exact frames for all of them but I was able to at least pinpoint frames that were nearly the same. I highly suspect that what we have in the Arrow transfer is a 2K scan of the negatives with a brand new color grade subsequent since the colors are quite different. I can't prove whether or not that's true since it's just officially detailed merely as a "Brand new 2K restoration approved by director of photography Robin Vidgeon", however it's quite obvious that there's some sort of going inconsistency here. Certainly makes me wish there's some release of this movie now that addresses this issue. Maybe some of y'all could give a crack at making a restoration of this color grade if you want a challenge or something. Obviously, I am taking my own advice on this. Unfortunately, I have little experience in working with color grading so bear with me please as I try to figure things out. At this very moment in time, I have created five separate LUTS (using Dr. Dre's Color Matching tool) for each of the stills and I am working on seeing if I can be able to mix all five into some sort of balanced mix. Unfortunately, though, that's not my only current problem since I seem to be unable to import the M2TS rip of the movie into Da Vinci Resolve (The instant I try dragging it in or importing it manually, it just crashes). So uh, yeah, I wonder how this will end up. Also, if anyone somehow has any scans of the movie's print I could use for further reference, I would greatly appreciate it since I haven't been able to find anything on my own (As of right now, I only have those five stills and I am currently asking if JohnCarpenterFan has any other scans he didn't post on that thread). Happy to see your first project, congrats! (2019-02-03, 01:08 AM)LucasGodzilla Wrote: Unfortunately, though, that's not my only current problem since I seem to be unable to import the M2TS rip of the movie into Da Vinci Resolve (The instant I try dragging it in or importing it manually, it just crashes). So uh, yeah, I wonder how this will end up. Try to mux it in mkv using MKVtoolnixGUI; it *should* work. Or, load it in VirtualDubMod and save it with a lossless codec (like Lagarith) that Resolve could read. (2019-02-03, 01:17 AM)spoRv Wrote: Happy to see your first project, congrats! Well unfortunately Resolve doesn't read MKVs so I guess I'll have to do the latter. What's the best lossless file format for Resolve? (2019-02-03, 01:23 AM)LucasGodzilla Wrote: Well unfortunately Resolve doesn't read MKVs so I guess I'll have to do the latter. What's the best lossless file format for Resolve? According to this paper - http://documents.blackmagicdesign.com/Da...c_List.pdf - Resolve could read H264 in a mov container, so you can just remux the m2ts file into a .mov one - there should be some remuxer that can do it, dunno which one though! Or, use VirtualDubMod and save as uncompressed avi yeah, size would be HUUUGE, but it should not give you any problem, plus it *may* be faster when seeking, instead of using a mov file. It's quite lovely when no matter what you're trying, nothing seems to work right. I downloaded the program and tried to load up the file when it game an error (Something about handle sub). Is it VirtualDubMod and not the "simple" VirtualDub? Because the latter can't load m2ts, while the former can - just load a 30+GB m2ts file into it, in a breeze! EDIT: SORRY! It was VirtualDub FilterMod!!! Unfair! I wanted to do the same thing. But I'm still hoping to find a third source of the Hellraiser master, possibly from the new French BD. Dunno about DaVinci, but you can easily import h264 muxed as .mp4 into Premiere and applya LUT with Lumetri. You need AviSynth+ for that though, as it only works in planar RGB 16-bit space afaik. (2019-02-03, 10:20 AM)TomArrow Wrote: Unfair! I wanted to do the same thing. 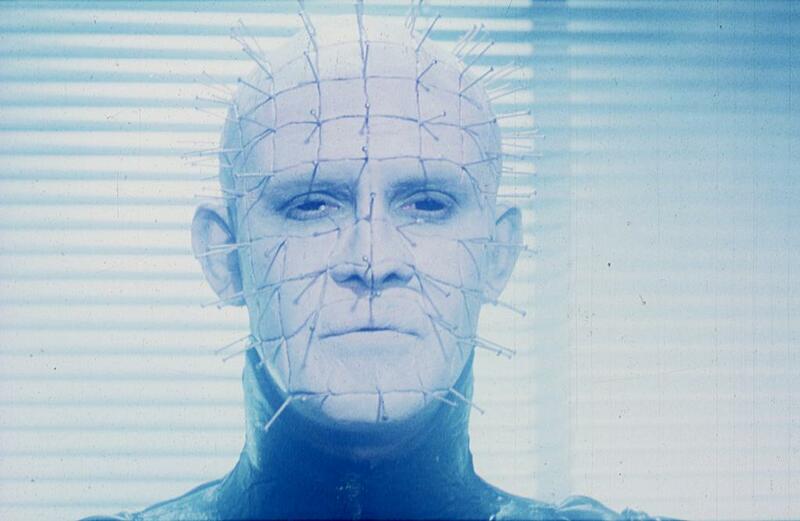 But I'm still hoping to find a third source of the Hellraiser master, possibly from the new French BD. My apologies lmao. The main reason why I’m using Da Vinci Resolve is because as of right now, I have five cube LUTs from the color matching tool for each of those stills and I need to strike a proper balance for the rest (Side note, I have zero experience with Avi Synth so ᵘʰʰʰʰ). Interesting, a handful of the DVD releases appear to be more accurately colored than any of the Blu-Ray screencaps I’ve seen. That being said, they all seem to have their own issues, the US version seeming to blanket everything in a dreary cold blue tone (and not the warm saturated blues seen) as an example. The PL release interestingly seems to be the most accurate to the attic scenes but least accurate to other scenes. Alright, so I finally managed to the movie imported into Da Vinci Resolve relatively correctly and I am currently facing the long and arduous task of having to do a shot-by-shot color correction to remain accurate to the frames. My biggest issue right now apart from the time it'll take due to me having to do this on-and-off is the lack of any proper references apart from those few stills. I have attempted to contact JohnCarpenterFan to see if he has any other scans he didn't post for further color matching, however as it is, I am forced to do some guess-work for certain scenes. Thankfully, I have seen a handful of visual references from other versions of the movies to help me judge how certain scenes should look. For example, judging still #3, I can determine that the Polish release of the movie is accurate color-wise in the attic scenes as an example. I've also been able to determine that the Italian Laserdisc of the movie (Special thanks to spoRv for the link) is actually pretty accurate to the hospital scenes as you may see below. Well, with time, I guess we'll see how this will turn out. And with luck, I may get more of the references I need.